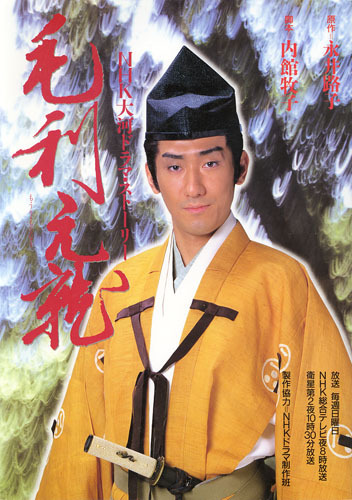 The 36th NHK Taiga Drama is Mouri Motonari. This series chronicles the life of Mori Motonari, a warlord of the early 1500s who stood at the vanguard of the Warring States era. All Japanese school textbooks contain the Mitsuya no kyokun, Mori's famous lesson to his three sons that teaches that while one arrow is easily broken, three arrows together cannot be broken. In 1997, 500 years after his birth, NHK dramatizes Motonari's rise from a chief of the region of Aki (now Hiroshima) to a daimyo who rules over ten provinces of the Chugoku region. Motonari was 64 years old and already the patriarch of a powerful dynasty about the time Oda Nobunaga and Takeda Shingen appeared on the scene. And even after his death, the Mori family figured prominently in Japanese history. His grandson Terumoto became a loyal Toyotomi vassal. Defeated at the Battle of Sekigahara, Ieyasu confiscated most of his lands, leaving him only with Suwo and Nagato, later known as Choshu. But 260 years later, the Mori got their ultimate revenge, leading the imperial forces against the Tokugawa in the Meiji Restoration.